Jodie Carey expresses her fascination with materials and the processes by which they transform into things in a new landscape-like installation composed of large-scale plaster pots, canvas wall hangings and a monumental pencil drawing. 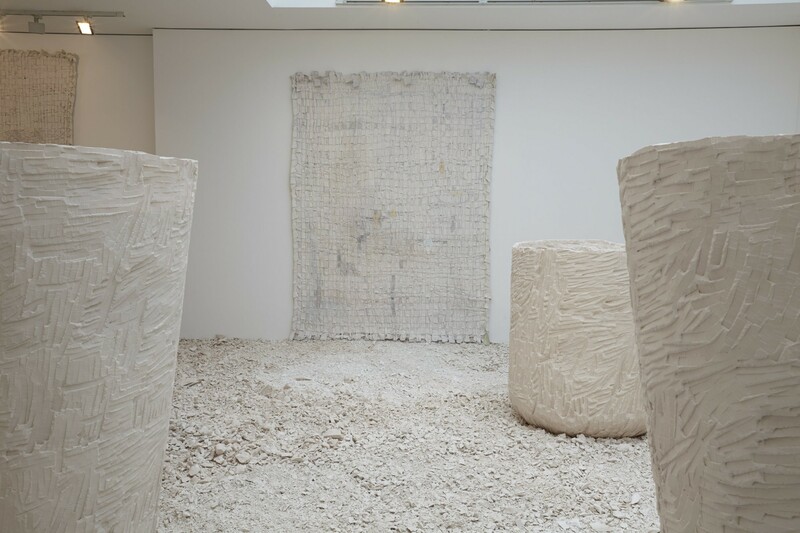 Five freestanding pots occupy a blanket of plaster rubble covering the gallery floor. Carey used a hammer and chisel to hollow and carve the pots, collecting up the chippings from her studio before emptying the rubble sacks at the point of installation. The rubble functions as a dramatic stage for the pots but also makes visible the physical labour involved in their making. Bearing a direct relationship to the scale of the human body, the pots entice the viewer to interact with them. Their textured surfaces also read in relation to a surrounding group of wall hangings, which are the result of another deeply physical process. The artist tore metres of canvas into strips, which were dyed, dipped in plaster and then woven whilst wet. By accenting the weave with colouring pencil, Carey activates the plaster coated surfaces and subtly connects the objects to a large-scale pencil drawing to resolve the installation. Carey’s drawing recalls the ancient practice of recording human events on walls and ceilings as well as the deep history of wall markings in the origins of art. Composed of thousands of individual pencil marks spanning an area measuring 270 x 436 cm this drawing is impressive both in scale and in its sheer physicality. Like a prehistoric cave painting, each mark bears witness to the idiosyncrasies and limitations of the artist’s hand. The drawing took fifty hours to produce and was made intensely over a week-long period. The wavering straight line at its right edge and the visual dissonance created by the haphazard extension of the drawing beyond the rubble accentuates the handmade feel of the exhibition and also shows there is beauty in imperfection. Carey selected the humble colouring pencil for its naivety and delicacy. By varying the weight and size of her pencil strokes, she creates a very soft textural surface that seems to tremble in space. This colouring technique extends and develops a process Carey used in a previous series of hand-cast plaster slabs (‘Untitled (Slabs)’, 2012) but here the effect is more immediate as the pencil is applied directly on the wall. As with the slabs, the idea of the monumental is juxtaposed here with a material that evokes fragility and vulnerability. The pencil might easily be erased with a rubber. This is very much a makers’ show. Each component has a tactile and sensual quality, from the chisel marks on the pots through to the weave of the canvas strips and pencil marks on the wall. These different textures run into each other, so that all three bodies of work seamlessly overlap and intersect. The installation was conceived specifically for Edel Assanti’s new space and Carey certainly utilises the gallery’s architecture to best effect. The skylight adds to the installation, opening up the space and illuminating the rubble with what might be a Holy Light.